In the XVIth and XVIIth century, the society was opposed that a woman was writing, rather, the women had few opportunities to express themselves and their condition was beneath the masculine figure. The convent in spite that the religious ones, were subject to certain controls and to the authority of their Superiors or confessors, was offering an ideal place to develop and to grow up the literary and cultural qualities of the woman. One of the cases most distinguished from the 16th century, there was holy Teresa of Avila, celebrated Castilian writer. This woman took the pen and formed with her out-standing works of the mysticism and, especially, with her autobiography, the Holy one of Avila it was model and example for many other feminine figures. Sister Maria de Jesus de Ágreda was one of them. Mother Ágreda was a woman with a luminous intelligence and, mainly, with a passionate heart, deeply enamored with God, we see it shaped in all her writings, even in the letters sent to King Philip IV. She was a fertile writer, authoress of series of works and letters of diverse shades, some with admirable lessons of politics, always with a completely Christian and modern sense. Others with mystical content, in which can be seen her merits of mystical writer, of force, inspiration, and of creative virtue. It was due partly to that, alongside Maria de Ágreda was evolving in the different stages of the spiritual and mystical life; her writings were acquiring more maturity. For example, her first writings are in a more juvenile style, more vivacious, simpler, and more expressive; though they expose already the ideas and phrases with the admirable order of her “manly” and disciplined understanding. According to the expert ones in the matter, these characteristics to write by divine mandate and in obedience to the confessors, were common in the epoch due to the condition of inferiority in which was the woman, this conferred certain authority to her writing. Nevertheless, “the writing of Maria de Ágreda enters, as all her life, in the same process of radical obedience. For her writing was one of her main penances.” (François Bonfils). This is clear in the Mystical City of God. Sister Maria, resisted for ten years to writing this work, whenever had written the first version, she burned the whole manuscript under obedience to an elderly confessor, who was firmly opposed that the women were writing by themselves about theological topics. Only twelve years later, by mandate of another confessor, the P. Andrés de Fuenmayor, she undertook under his obedience, the second draft of the life of the Virgin, around the year 1655, being concluded on May 6, 1660. Maria Coronel Arana is also, a writer who investigates the topics that she is going to treat; that asks, that does not remain with the doubts. Since any contemporary writer would do it. She was possessing abundant bibliography, which still is conserved in her monastery. She is a writer who speaks about what it happens in her epoch and the currents that they are in vogue in the time in which she lived. It might not be otherwise, any writer is influenced by his environment, for that reason sometimes it is difficult to read this woman, since sister Maria de Jesus lived in the Baroque. One of the most common characteristics in the literature of the Baroque was to write with elegant, “sublime” style, for this the language that Maria de Ágreda uses in her writings is in the habit of being very high and much adorned, as it happens with the art of the Baroque. But, if we remove all this apparel of the Baroque, we will face beautiful pages, full of messages that speak to the heart and sing the most beautiful praises to the Lord and to the Virgin Mary. It is the unique thing that desired Sister Maria, to glorify her Creator and to honor Immaculate Maria. And for it her writings were a sweeping source. May God wants that the reader of her works approaches them not only seeking to know this woman but also seeking to know Whom who was her maximum inspiration. In order to finalize, we textually reproduce words that Fr. Andrés Ocerín Jáuregui wrote, in occasion to III the Centenary of Sister Maria de Jesus de Ágreda in 1902, published in Tarazona. Fr. Ocerín beautifully describes to us some of the characteristics of the literary style of two women who are great mystics and writers of Spain. “Each author prints in his writings the own seal that usually reveals to us, not only the moral character, but also the physical constitution, the education, and even the life style that has taken: and thus both Santa Teresa and Maria de Jesus made of the paper the informer of their souls, to it trust their more intimate secrets, they explain the most delicate feelings of the heart on it and in it they leave the true portrait of their great spirit. Teresa is the personification of the spiritual love that holds, that blinds, that flies, that exclaims with strong moans so she loses of sight her Beloved that is overjoyed and jumps of happiness on having found him. 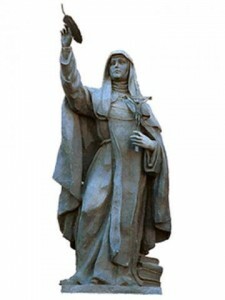 Sister Maria de Ágreda is the incarnation of the love that encourages, that ponders, that he walks always reflective, slow and quiet, that is become sleepy in the happiness, that languishes in the contradiction: Maria is the angel temporarily exiled of the Sky, that praises and embraces God possessing him, and sighs as turtledove when loses him of sight. Teresa sees God and wants to have to him. Sister Maria sees him and wants gain him. Maria de Jesus to enjoy Christ , she wants to imitate to him, and for this she is embarrassed. Teresa goes to the mortification to be jointed with him. Maria de Ágreda goes in search of Jesus. Teresa goes out for him to the encounter. Maria adores to him. Teresa embraces to him. Maria prays. Teresa sings. This one is gladder; Maria is more serious and severe. This one more is retired and quiet; Teresa is more intrepidly. Maria has studied the world; Teresa has surprised it. Teresa has more feeling; Maria has more understanding. Teresa is a woman without equal; Maria is a man by her rare maturity and gravity. In her writings, as in her characters, Teresa is enthusiastic, impetuous, shaken and crossbeam; Sister Maria is rested without abandonment, active without agitation, hardworking without restlessness.